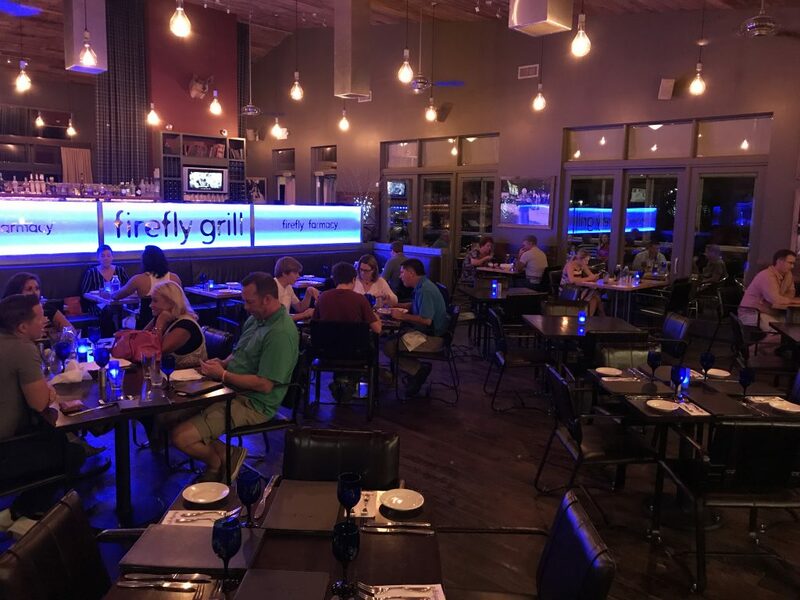 Modern yet comfortable, elegant yet casual, sophisticated yet rural, Firefly Grill in Effingham, Illinois is a paradox. In a setting befitting a roadhouse that carelessly slings giant, average steaks, Firefly is in fact a farm-to-table delight. 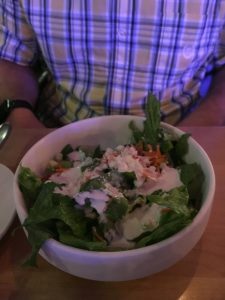 Serving ingredients grown and sourced locally, Firefly elevates its food far beyond what a diner might expect in the tiny town of Effingham, Illinois (population 12,604). 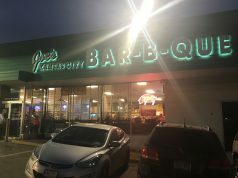 Put simply, it is our favorite restaurant in the Midwest. It belongs among, or atop, the best restaurants in Chicago, St. Louis, and beyond. Chef Niall Campbell II was raised on a small dairy farm in Maine. He and wife Kristie met in Puerto Rico. The pair stopped by Effingham, Kristie’s hometown, en route to a life in swanky San Francisco. Just months after they arrived in the Bay Area, however, the heartland came calling again, and they headed back to Effingham. We’re so glad they did. 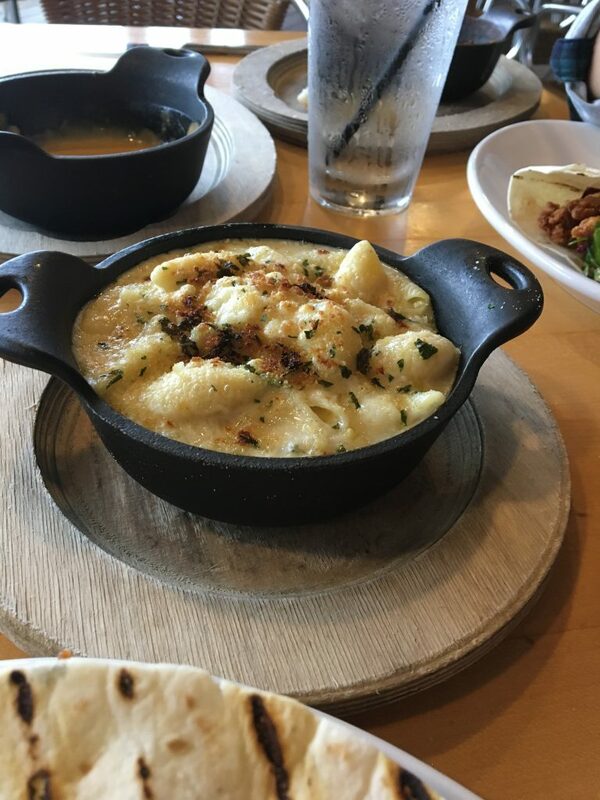 Chef Campbell’s creations are inventive, inspired, and delightful. 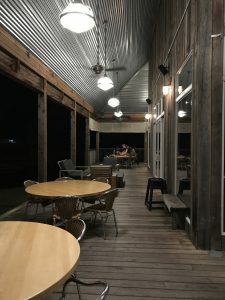 One typically doesn’t expect to be shown whole new tastes in a corrugated metal-roofed outpost, but that is exactly what you get inside of Firefly. As impressive as the food is, the property is equally impressive. It strikes a balance between elegant and shabby chic, and between cosmopolitan and pastoral. Step out behind the back room (they call it “The Sunset Room”), and you are presented with Kristie Lake, Firefly’s own stocked pond. The pond also irrigates their ultra-organic garden. The Campbells grow the vegetables for their creations in that garden, where no pesticides, herbicides or synthetic fertilizers are seen. The mint they grow goes in hand-made mojitos and also serves to keep the mosquitoes away. 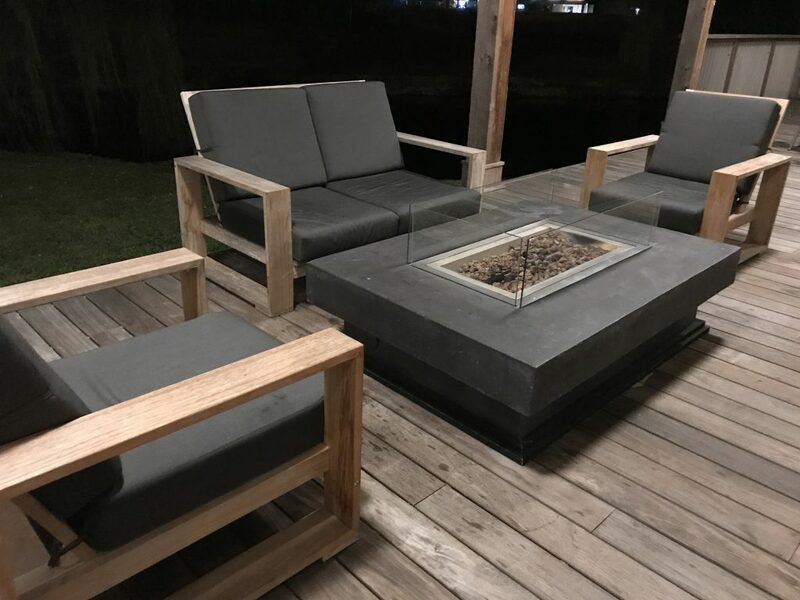 Step out the side door instead, and you are met with a very modern fire pit and comfortable seating, perfect for sipping an after-dinner digestif. The patio surrounding it features reclaimed barn wood and a relaxed feel. We’ve been to Firefly half a dozen times, and every time we have had our expectations surpassed. 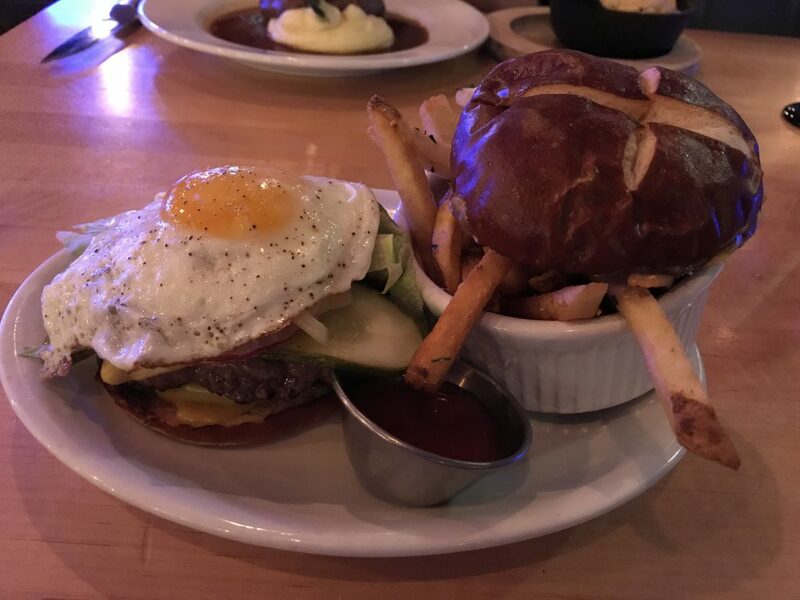 The first time we made the hour-plus drive to Effingham, we each tried the All American Burger (adding an egg on top). We like fine foods, but burgers are still among our favorites. In a way, a burger is a good measuring stick for the way a restaurant treats its cuisine. Did any thought go into it? Or is that spot on the menu just reserved for diners who opt out of the more creative (and expensive) options? Firefly’s All American Burger is wonderful. It is served with lettuce, tomato, onion, pickle, jalapeños and American cheese on a soft, but still dense, pretzel roll. They serve it with a side of skin-on fries that make you envision every step of that potato’s journey; from the garden out back, to the sink, to the chopper, to the fryer, to the table. We finished the meal with a selection of imaginative dessert shooters — just a couple of bites deep, but enough after the substantial burger. Impressed by the staples, we ventured into finer foods the second time around. We started with the Charcuterie Board ($18, and well worth it). Featuring “house-made lavash cracker, fig jam, Swedish mustard, Capocollo, rust belt, duck prosciutto, barren bleu, Kentucky rose,” every taste is on that board, from sweet to bitter, from salty to umami. 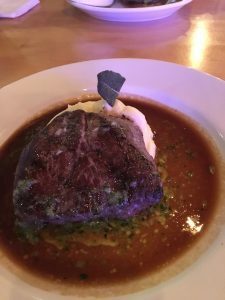 Tiffany had the Premium Prime Filet ($32) with compound herb butter and found it perfectly grilled and tender on a bed of homemade whipped potatoes. By the time she was through, she was wondering if she had room for a second. Jim tried the New York Strip instead. 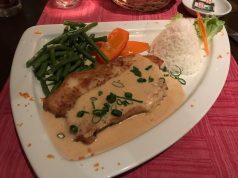 A New York Strip is available perpetually on the dinner menu, but the particular preparation was on special at the time. It was in a delectable brandy reduction sauce, along with out-back-grown fingerling carrots. Not just a piece of meat on a plate, it was given a gourmet treatment. Probably the best New York Strip we’ve ever had. From the bar, Tiffany had their peach sangria, while Jim finished the meal with a snifter of sweet Warres Warrior Port ($9). both drinks were handmade and worth the price. That’s a Peach Cobbler (available on special). It comes with a boozy ice cream, which we subbed out for vanilla. Warm, sweet, crunchy and crumbly with the peaches retaining just the right amount of firmness. Now, I’ve just raved about the filet, charcuterie board and drinks, and called the New York Strip the best I’ve ever had. But even still, the peach cobbler was the highlight of the meal. Firefly changes its menu often, so we try to get the specials while they’re available. 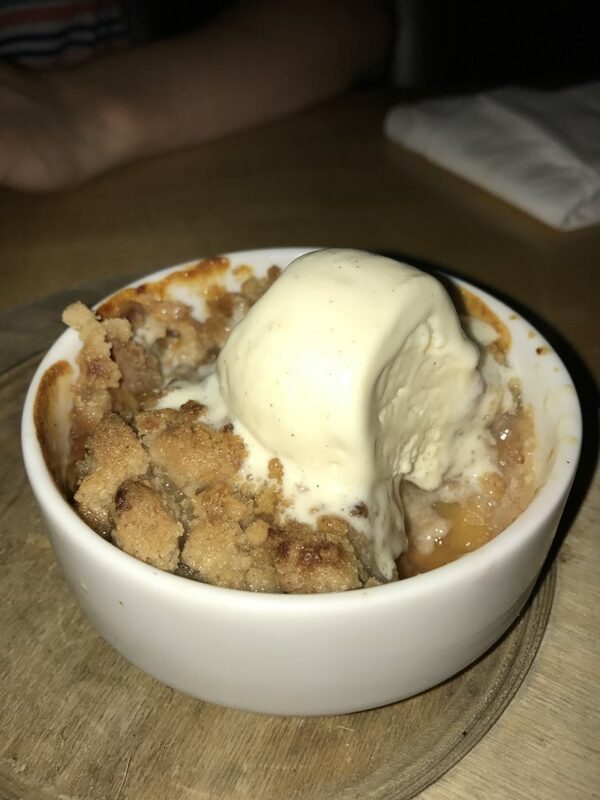 If you should find the peach cobbler available, jump on it. We want to jump in it. If it soundS like we’re gushing, we are. BUT WE HAVEN’t started yet. The Pork Porterhouse ($28), a thick chunk of pork cooked sous-vide so it was perfect all the way through, with fried butternut squash from the garden and caramelized apples. 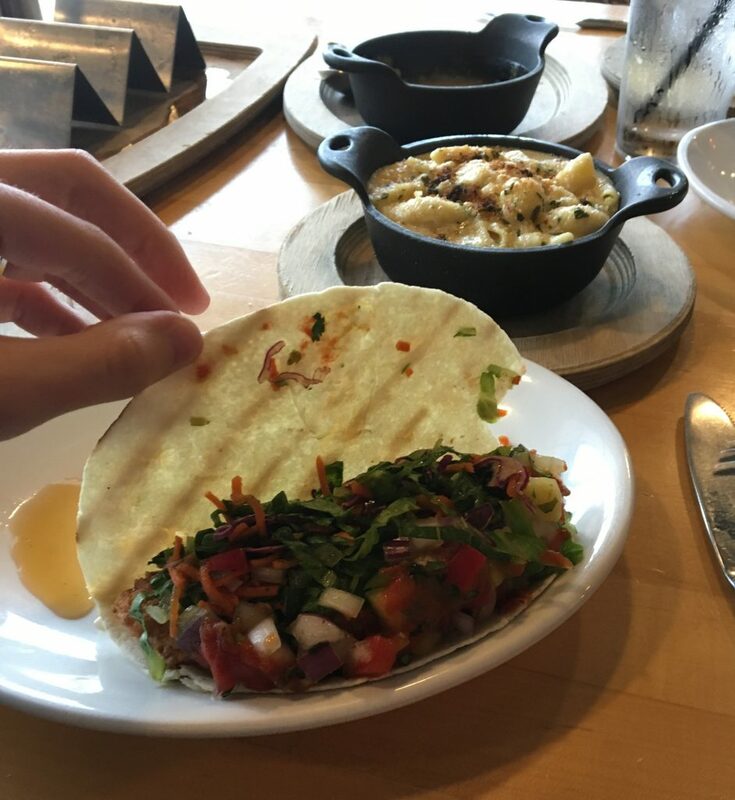 The Jalapeño Fundido ($12), a special appetizer that was the absolute highlight of meal #4. 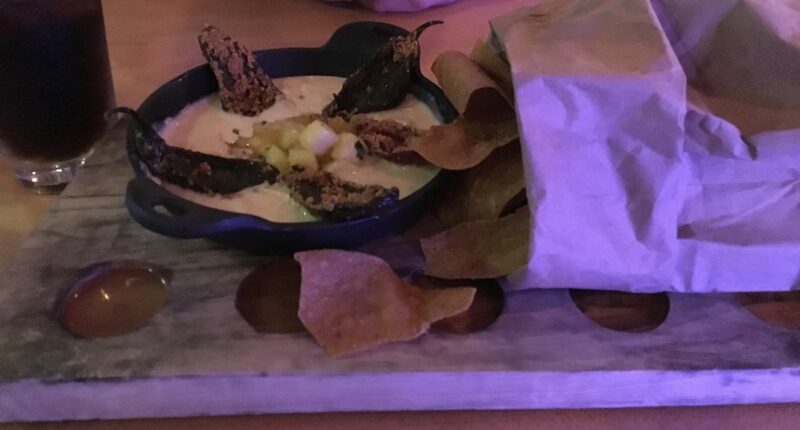 The cheese dip comes with fried Jalapeño slices and a bag of thin, salted tortillas. 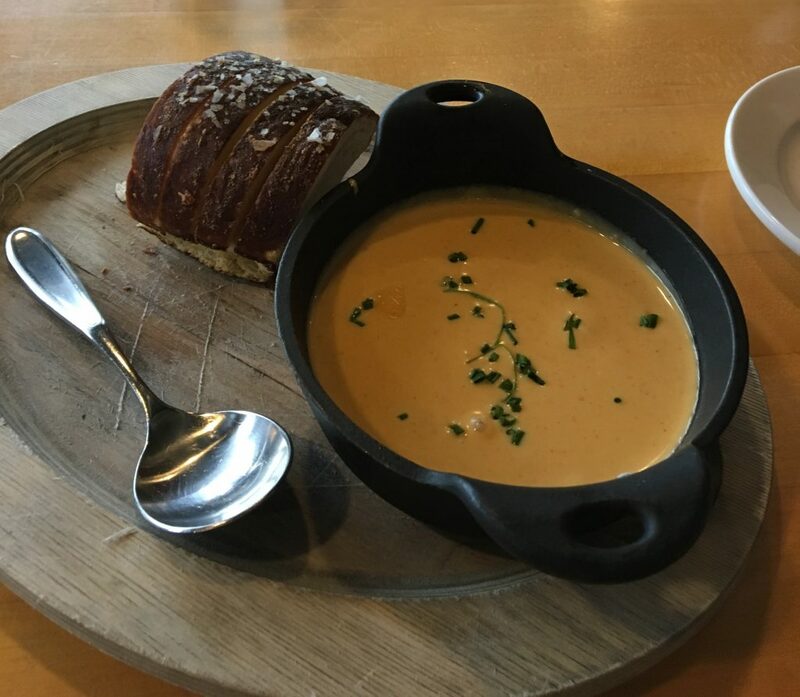 Beer Cheese and Pretzels ($10 from the lunch menu); steaming pretzel bread with warm cheese. 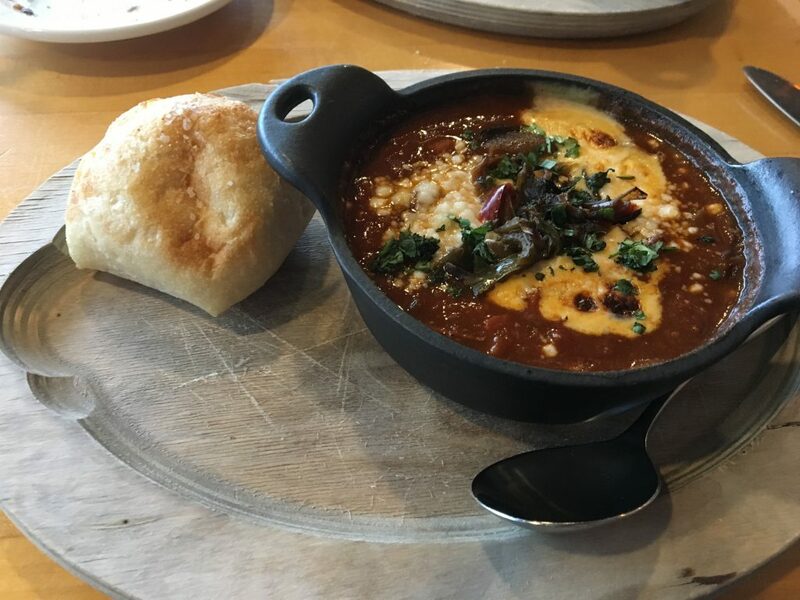 The house chili, with a blend of meats and grilled onions that made it depart from the standard. Of course, Firefly Grill never does the expected. Baked Shells & Cheese ($6 as a side); comes in a crock bubbling, with a breadcrumb topping and shells that hold a good amount of cheese. Fish Tacos with a pineapple pico de gallo ($15). 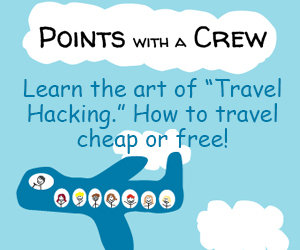 There are a few more things we need to mention before we go. First, Firefly has a nice, refined main dining space. It’s casual but romantic, and we just don’t have enough good things to say about it. Our first, last, and only complaint is that the two times we have sat in The Sunset Room, it was kept way too cold; we were ashamed we didn’t remember a coat the second time, but since then, we just ask not to be seated there. But there’s still more good. Firefly has a seasoned, professional, attentive, knowledgeable waitstaff. These aren’t first-job, first-year waiters. They have tried everything, and they know about it; not just the words on the menu. They commit the specials to memory, and they have tried them. Drinks are replaced before previous ones are gone. The staff is friendly to boot. People notice, too. 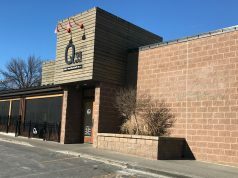 Tripadvisor ranks it #1 of 51 restaurants in Effingham. Yelp also ranks it #1. So, now, here’s the thing. You may never have been to Effingham, Illinois, but it’s situated at a unique crossroads. It’s at the junction of I-57, which runs from Southern Missouri to Chicago, and I-70, which runs from Baltimore to Utah and between Indianapolis and St. Louis is one of the most driven Interstates in the country. Chances are that at some point in your life, you’ll be driving through Effingham. 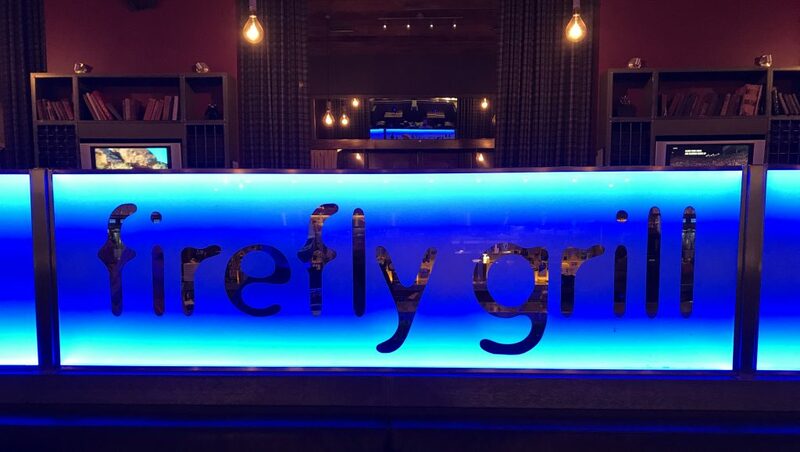 When you do, don’t miss Firefly Grill. And if you don’t chance upon Effingham, plan a special trip there. It’s that good.